Welcome at the beginning of a new generation. ARTIS® is the first fully integrated collection of 30 products cardio, strength, and functional. 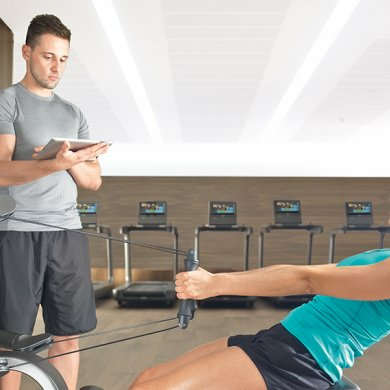 A uniform design defines a training zone anew, offering totally connected training experience to assure a natural feeling of movement, reduce, process and refresh energy. We provide at your disposal professional equipment of a reputable brand Technogym. It helps to refine, among others, leg, buttocks, shoulders, spine, or back muscles. We took care of a well-equipped Free Weights Zone in ARTIS Wellness Club. We believe that amidst our club members there are fans of squats with barbells, swings with kettle bells, or dead lifts. In a functional zone at ARTIS Wellness Club you will find innovative equipment which will help you train more effectively, safer, and in good atmosphere. No matter if you feel like making vertical steps, taking a fast stroll, or energetic running – with ARTIS VARIO you can freely adjust movements, since the equipment adapts automatically to preferences of the user and is equipped in a step length range, which reaches up to 83cm. A training with Vario is effective, since the distribution of load is balanced, which leads to reduction of perceived tiredness and at the same time the highest, in its category, yearly caloric expenditure is kept. Optimal Start is a patented, automatically switching on piece of equipment made to make your first step easier and prevent any potential pedal lock. Cyclists riding an ARTIS BIKE will feel as if they were riding along the road. Reduced distance between pedals and an optimal saddle setting in relation to pedals ensure more realistic and biomechanically appropriate experience of riding. Handlebars are designed in a way so that they could provide the absolute riding experience: you can easily change between the position of a city bike, standard one, and a dynamic racing position. Soft Return System (patent pending) at ARTIS SYNCHRO reduces sudden acceleration between steps, increasing comfort of workouts and ensuring fluency of motion during the whole training. A safe access to the equipment is provided due to a specially considered design, which together with an automatic reset option, stops the pedals and levers in the most comfortable position to get off. Owing to the widest passage in the industry (50cm) and supporting handlebars from the side of the interface ARTIS RECLINE is the most accessible recumbent bicycle. A padded back with four permanent positions, which can be easily adjusted from a sitting position, provides comfort for users of any physique. The shape of the back seat facilitates straightening of your lumbar muscles and limits hips extension to minimum. Setting the range of movement is a piece of cake. Just press the appropriate button and you can adjust the range to your preferences or physical limitations. Two footrests guarantee support and stability during the training, without any need for regulation. Separate levers allow you to build strength more steadily. The plane of movement is slightly pulled forward to minimize joints load. Neutral Grips allows you to diversify exercises and adjust them to personal preferences. Counterweight on each lever reduces initial resistance. One place where you can enjoy natural movements and an exciting training. Due to two hidden piles with loads users can make endless series of natural movements and exercises. Kinesis ® One has certificates for medical use and physiotherapy, therefore, it is very precious for places adjusted for users of reduced mobility or those using physiotherapy after an accident. As the name suggests, OMNIA ™ (‘everything’ from Latin) provides an endless number of possibilities in all types of training – strength, endurance, flexible, coordination and high-speed – to meet the needs, possibilities and aspirations of users. OMNIA™ ensures everything you need to make adjusted group trainings. As the name suggests, OMNIA ™ (‘everything, from Latin) provides an endless number of possibilities in all types of training – strength, endurance, flexible, coordination and high-speed – to meet the needs, possibilities and aspirations of users. OMNIA™ ensures everything you need to make adjusted group trainings.